What is a roundabout? A roundabout is a traffic junction that merges different streets or highways. You can choose to drive in a continuous circle in order to wait for the best time to merge, or select your desired means of merging and go ahead. There are many roundabouts in Doha, just like any other major city. However, the “islands” that make up the center of the roundabouts can be pretty astounding. If you’re looking for scenic routes, you can choose a roundabout from nearly any location and get a picturesque view. Some of the roundabouts have giant structures, sculptures, or buildings that make driving past or around it a real treat. Don’t limit yourself to just one of the roundabouts, visit them all! Although it may take a great deal of time to reach every single roundabout, the picture opportunities for a budding photographer may be well worth it. Taking photos of Doha roundabouts can be a time consuming thing, but the end product could be well worth it. There are many sites on the Internet that advertise and will pay for high quality photos of specific geographic areas. Doha roundabouts are on that list. So which Doha roundabouts are worth seeing? There are a few, so we will list the ones with the most impressive visual appeal. The Oyster Shell roundabout is an impressive feast for the eyes. It looks like a giant oyster shell with two sides. One piece is rather large and the other is smaller in size. The color is a cream white with a bluish base holding it in the air. 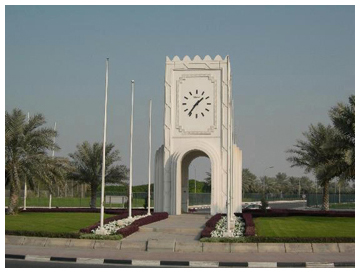 On Al Markhiya Street you will find the Oryx roundabout. This roundabout is beautifully designed and expertly crafted. Two intertwined structures of concrete weave up into the sky. It looks like the universal health symbol. That is fitting, since this is also called the Buraimi Hospital Roundabout as there is a hospital nearby. It looks absolutely extravagant. The next roundabout we are taking a look at is called the Rainbow Roundabout. This roundabout structure looks very unique. Picture half of a ring with a solid blue slab of color throughout the middle. It’s gigantic too. This presents a very adequate photo opportunity as well. While roundabouts are nothing special alone, the time and dedication that was put into creating something special to look at is quite becoming. Be careful when driving to keep your eyes mainly on the road, as gazing at the structures at the roundabout could mesmerize you! Be sure to bring lots of film and be prepared to make frequent stops at the roundabout locations that allow you to park your vehicle. The reason that Doha has so many roundabouts is the fact they do not like to use traffic lights. Citizens rely on the solid judgement of fellow drivers in order to make their way through the majority of these areas. You can find roundabouts in many of the highly populated and popular areas of the metropolitan area.